The StratoBus project may immediately call to mind Google’s Project Loon. 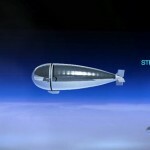 But the advantage of StratoBus is that it offers long endurance and complete autonomy from a fixed position, while the high-altitude balloons in Loon move around the Earth and will offer only limited autonomy. StratoBus, a surprising vehicle halfway between a drone and a satellite, will be able to carry out a wide range of missions, including observation, security, telecommunications, broadcasting and navigation… and it offers a lifespan of five year. The StratoBus project is led by Thales Alenia Space, along with partners Airbus Defence & Space, Zodiac Marine and CEA-Liten. It embodies a new concept for an autonomous airship, operating at an altitude of about 20 kilometers. This is in the lower reaches of the stratosphere, but well above air traffic and jet streams. 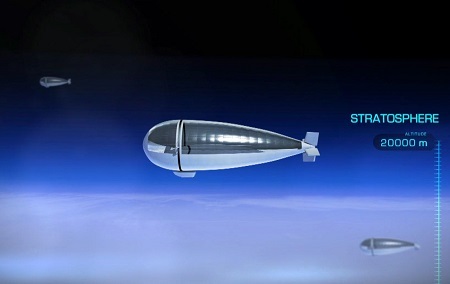 StratoBus will be able to carry payloads up to 200 kg. The project is part of the creation of an airship company by the Pégase competitiveness cluster in southern France. The StratoBus in the stratosphere. The platform itself is a high-altitude airship measuring 70 to 100 meters long and 20 to 30 meters in diameter. It will feature a number of technological innovations, in particular to make sure it captures the Sun’s rays in all seasons: a power generation system (coupling the solar panels to a solar power amplification system patented by Thales), an ultra-light reversible fuel cell for energy storage, etc. This entry was posted in Airships, New technology and tagged airship, Stratospheric airship, surveillance blimp, Thales, Thales-Alenia, unmanned airship. Bookmark the permalink.